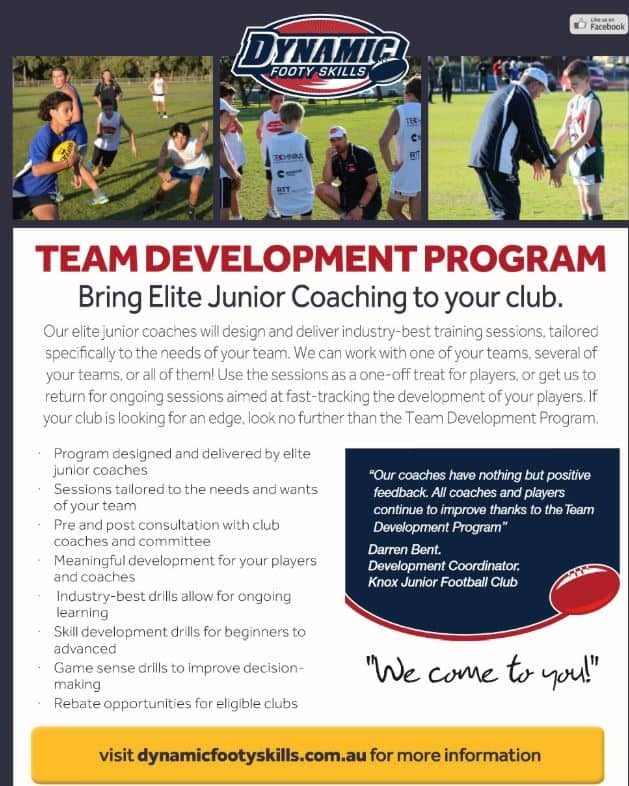 Dynamic Footy Skills run a number of in club programs throughout the junior season, the TEAM DEVELOPMENT PROGRAM (TDP) being our major in 2019. What does the TDP look like? Once club approved, Dynamic Footy Skills will allocate coaches to attend your club and run the training session for 1 or many of your teams depending on the request of the club. The DFS coach will conduct the training session with the players with teams coaches present. The DFS coaches will be fully engaging with the club coaches throughout the training session, especially around the ‘key coaching points’ for each of the drills. What night of the week are Team Development Program’s run? DFS work with the club and sessions are run on the club’s training nights. For example the club has training on Tuesday night’s and the Under 14’s train at 5.30pm – 7.00pm, that is when DFS would run the TDP with the coaches of that team present.